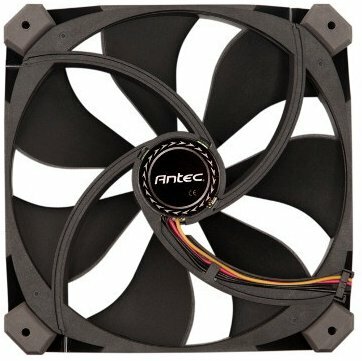 Antec introduced the TrueQuiet Pro 120, a new 120mm fan that supposedly uses revolutionary fan blade technology. The fan offers a two-speed control switch, enabling you to choose between 600RPM and 1200RPM. At these speeds, the fan delivers 21.1CFM/46.3CFM at a noise level of <17.8dBA/18.9dBA, respectively. The fan will be available on or around March 22nd for around $19.95. Antec, Inc., the global leader in high-performance computer components, announces the TrueQuiet Pro 120 enclosure fan. The TrueQuiet Pro 120 combines a completely redesigned fan blade with special Quiet Computing features to deliver high airflow with minimal noise. Revolutionary Fan Blade -- The fan blade of the TrueQuiet Pro 120 is a departure from traditional axial fan blade designs; it is attached to the frame, forming a type of cylindrical turbine. This design provides the fan with a greater cooling surface area, while eliminating turbulence associated with traditional fan blades that "chop" the air by the frame. Flexible Quiet Computing -- The TrueQuiet Pro 120 keeps noise at a minimum due to its built-in silicone grommets and tool-less silicone mounting pins. Additionally, the TrueQuiet Pro 120's convenient two-speed control switch allows users to choose between 600 RPM silent operation and 1200 RPM high performance cooling. User-Friendly Installation -- Equipped with tool-less mounting pins, the TrueQuiet Pro 120 installs easily into nearly any 120 mm fan mount. A 3-pin to Molex adapter is also included to accommodate users who do not have 3-pin motherboard connections. "The TrueQuiet Pro 120 is a revolution in powerful, yet silent PC cooling," said Mafalda Cogliani, Global Marketing Director at Antec. "Its unique design provides an airflow-to-noise that competitors will be hard-pressed to match." The TrueQuiet Pro 120 is now available in North America at Fry's Electronics, NCIX, Canada Computers and other major retailers and etailers at an MSRP of $19.95. Mass availability is expected in Europe on or around March 22, 2012.